Giving away freebies and content upgrades is all the rage right now. Everyone seems to be doing it and for good reason, but how? 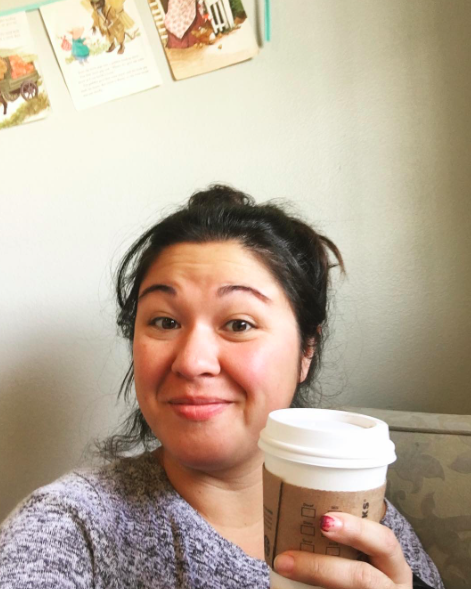 The tech stuff doesn’t come easily to everyone so I’m going to walk you through two options to use Squarespace and MailChimp to give your new subscriber a download after they sign up. You want to go the quickest, easiest route. No switching over to the mailchimp website and editing email templates, etc. This is actually how I had everything set up before moving to Leadpages, but I won’t go into that right now because I know most people prefer Mailchimp (hello? It’s free!). So I’m going to show you one of my older posts that is still using Mailchimp and Squarespace to deliver my content upgrades. 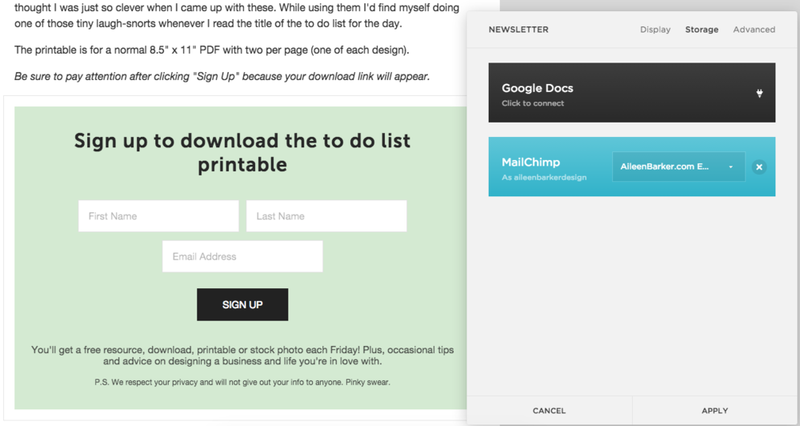 This first option uses the Newsletter block in Squarespace as you can see above. 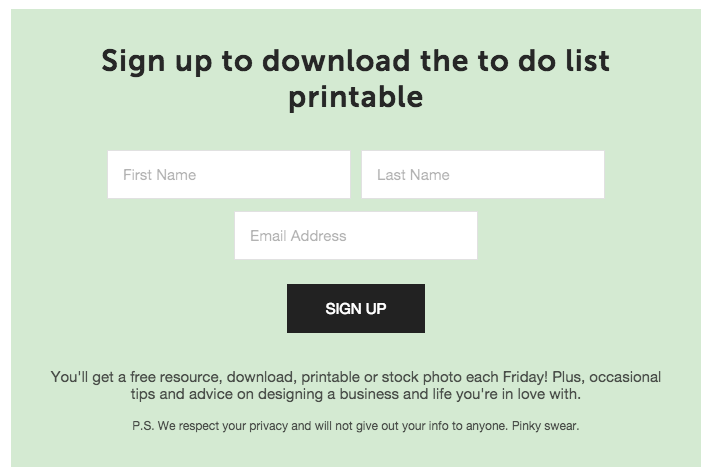 The first thing you want to do when you set up your newsletter block is to connect it to MailChimp. Click on the “Storage” tab and click “Mailchimp”. From there you will sign into your MailChimp account and then select the list you want to be adding people to from the drop down. Next you’ll want to make sure to deliver the link to your download. Click the “Advanced” tab and add the link under the “Post Submit Message” section. This is exactly what will show up in the box when your subscriber submits their information. 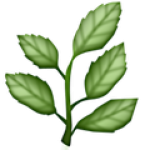 You can add a link here! Done and done! 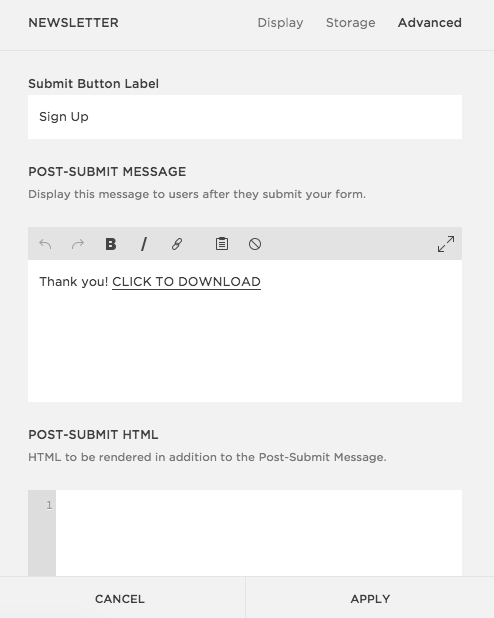 Now when your subscriber submits their information in the form, a download link will appear as you can see in the example above. I think this is the simplest method and a great one if you’re going to offer more than one download. This option is best if you want to make sure the subscriber gets the link in their email (option #1 is a risk in case they don’t see the link and click out). Next you’ll log into Mailchimp and click “Lists”. 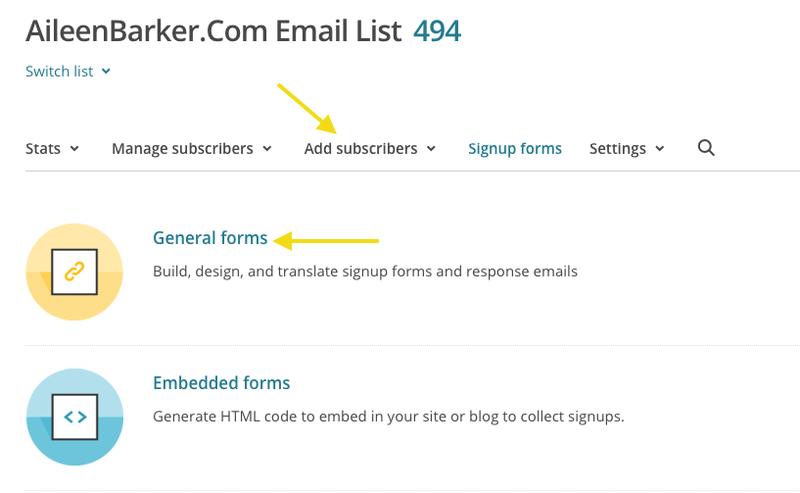 Click on the “Sign Up Forms” link and then click on “General Forms”. Now in the dropdown select “Final Welcome Email” and when you do make sure that the “Send Final Welcome Email” checkbox is checked. Then all you have to do is build out your email, add the link, save it and you’re good to go! Once anyone signs up for this email list from ANY subscribe box, they will get this welcome email after confirming their subscription. Prefer to watch a video to walk you through? Got you covered! And that’s it! It’s pretty easy after you do it the first time, but make sure to save, pin, bookmark this post for later so you can reference it when you need it. 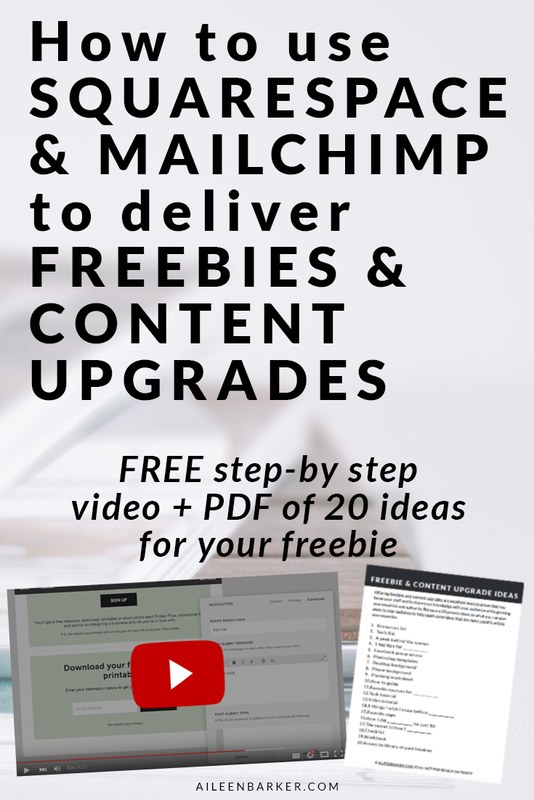 I also created an awesome list of ideas for freebies and content upgrades to help you along so make sure you download that if you’re still brainstorming! Thank you Aileen! You are seriously an angel from heaven. How did you know I’ve been struggling with this? Haha! 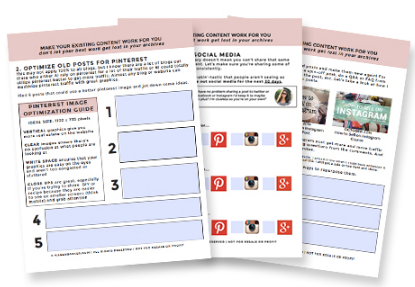 I’ve been trying to give away this awesome worksheet (http://kelseyaida.com/ownyourpower-winatlife/) when people sign up on my blog, but for whatever reason not all the emails that get submitted in the Squarespace Newsletter Block actually make it all the way to Mailchimp. You can see how that’s a problem in itself, but then I also set up an automation that sends them the PDF. So a bunch of people weren’t getting it! But now my life is forever changed because I can put the link in the post submit on Squarespace. So brilliant! So simple. I’m fixing it first thing tomorrow. Aw man thanks for this amazing comment! I’m glad I was able to help you figure it out, Kelsey! I wonder if the reason some people aren’t making it to Mailchimp because they aren’t confirming their subscription. Or is it a different problem entirely? Either way good luck and I hope you figure that out, but in the meantime I definitely love the ability to put a link directly in the post after submit. Thank you so much for this post! You’ve just solved the problem I’ve spent half the day on in about 30 seconds! Hi Aileen! This tutorial was super helpful. I have been setting it up where I have multiple lists and that is totally not working 🙁 I think I want to switch to the first way you mentioned. I do have one question though, I have a free email course is there away that I can segment these readers so I can trigger mail chimp to send only those subscribers the series? Thanks so much for creating such a great tutorial! I have the same question too! What happens if I only want the freebie to be given out to some people only on my list who’ve signed up through a different tie-up? The freebie’s only valid through this other tie-up? Do I need to create a different list? (But I still want to link them back to a master list)? I think the only way to do this in MailChimp is to add them to their own list, but I believe if you’re going to send more than one automated email you do need to upgrade to a paid subscription.